The MSM routine should be used when you negotiate a hazard. What do the initials MSM stand for? The MSM routine should be used when you negotiate a hazard. What do the initials MSM stand for? This guide explains how you might need to alter your road position when driving to drive around challenging road layouts and obstacles, and to deal with adverse conditions. The basic procedure for negotiating a hazard is MSM: mirror, signal, manoeuvre. This means that if you want to move left the first thing you check is your nearside (left) mirror, and if you want to move right, the first thing you check is your offside (right) mirror). MSM is slightly flawed in that it doesn't tell you to check your blind spot, which you should do before the manoeuvre. As you approach a junction, choose your lane early. If you make the wrong lane choice, don't change lanes at the last minute as this could cause another vehicle to hit you from behind. You can always turn around once you have gone through the junction. When you are turning right at junctions the last thing you should do before turning is check your blind spot to your right - this is called a lifesaver glance or a head check if you are riding a motorbike. If you are turning left you should check left for cyclists or motorcyclists that might be overtaking you on the nearside. Motorcyclists are much less visible at junctions. If you want to pull up on the left just after a junction, don't indicate until you are past the junction. If there are no road signs or markings do not assume that you have priority. Remember that other drivers may assume they have the right to go. No type of vehicle has priority but it's courteous to give way to large vehicles. Also look out in particular for cyclists and motorcyclists. When you want to go straight on at a roundabout, don't signal as you approach it, but indicate left just after you pass the exit before the one you wish to take. If you are turning left at a roundabout, indicate left as you approach the roundabout. If you are turning right at a roundabout, indicate right as you approach the roundabout and then indicate left after the exit before the one you want to take. Horse riders, long vehicles and cyclists are likely to take an unusual course around a roundabout. Drivers of long and large vehicles need to plan their routes to avoid roads with weight, height and width restrictions. Long vehicles may have to move out to the right before turning left, depending on the angle of the corner and the width of the road they are turning into. They also might need to enter your lane when turning from a side street on the right even if they are heading in the opposite direction. Mini roundabouts can be difficult for long vehicles, but drivers should try to avoid driving over the roundabout as much as possible. 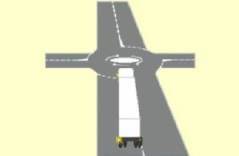 If a roundabout has two right-turning lanes, long vehicles should turn right from the left of these two lanes. If you see a long vehicle indicating left, don’t assume that you can overtake it on the right. Also, if you see a long vehicle moving to the right without indicating, don’t try to dive up in the inside – it can be particularly dangerous for cyclists as they will probably end up in the lorry driver’s blind spot. Tall vehicles approaching narrow bridges might need to change position. In this example there is a height restriction on either side of the bridge so you will need to move towards the middle. In this example there is a width restriction. And in this example a length restriction. 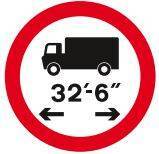 Therefore if, for example, your lorry is 30 feet long and your trailer is 15 feet long, you are not allowed past this sign. 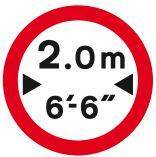 Other bridges and obstacles could have a maximum height sign like this. 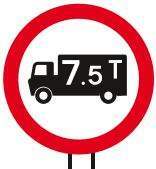 Other roads will have a weight limit for certain types of vehicles, e.g. trucks. Therefore if, for example, you are driving a 12m fully laden coach and you approach this sign you can ignore the following sign. 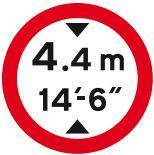 Special maps are produced that show height and weight limits on UK roads. Motorcyclists will often look over their right shoulder just before turning right. This is called a lifesaver and is a glance into the biker’s blind spot to check for other traffic. If you see a motorcyclist do this, expect them to turn or change lanes. At junctions it’s more difficult to see motorcyclists as they are smaller and are easily hidden, especially in your blind spots. Large vehicle have more blind spots than smaller vehicles. If you are waiting to turn left out of a side road and you can see a large vehicle coming from the right. You should wait until it has passed because large vehicles can hide other vehicles that are overtaking, especially motorcycles which may be filtering past queuing traffic. You need to be aware of the possibility of hidden vehicles and not assume that it is safe to emerge. When a vehicle is approaching from the right and indicating, wait until you can confirm it is turning before pulling out as the driver may have left the indicator on accidentally. In the scenario shown below it's better to keep the vehicle on the right of you because you have a better view of approaching traffic. Long vehicles may have to take a different line into a side street to avoid mounting the kerb. The only time you are allowed to drive across a footpath is to turn into a driveway. Take care on motorbikes and cycles when driving over railway level crossings if the tracks are not perpendicular to the direction of the road as you could get your wheel caught in the tracks. Metal tracks are also slippery when wet. 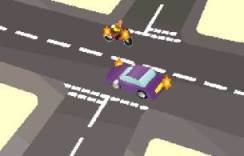 If you are driving across a crossing and the lights start to flash, continue across. If you are driving up to a crossing and the lights start to flash you must stop and wait for the train to pass. You should be using your mirrors at all times when driving, and also before you open your door so that you don’t open your door into a cyclist or other vehicle. Before turning left you should take a final look in your left mirror to check for vehicles coming up the inside, especially if you have had to move to the right before turning left (if you are driving a long vehicle or a vehicle towing a trailer). Also check your nearside mirror when pulling in after overtaking and after passing pedestrians on a nearside kerb. 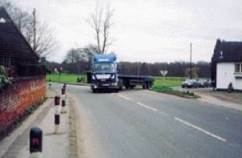 Some heavy vehicles have multiple mirrors so that they can see the nearside kerb in relation to the wheel. Most new cars have electric wing mirrors which can be adjusted for a better view when reversing; some even do this automatically. Before reversing you must always look all around. Check out our comprehensive reversing guide here. Trucks, buses and coaches with a high driving position have reduced visibility in front of them and should be careful of pedestrians and cyclists directly in front of the cab as they pull away. Use the left lane on dual carriageways and motorways unless you are overtaking. You can do this even if you are travelling at the maximum speed for your vehicle. On a three-lane or two-lane dual carriageway, you can use the right-hand lane for turning right. You should normally use the left-hand lane on any dual carriageway unless you are overtaking or turning right. When overtaking on a dual carriageway, look for vehicles ahead that are turning right. They're likely to be slowing or stopped. You need to see them in good time so that you can take appropriate action. Vehicles over 7.5 tonnes can only use the right-hand lane of a motorway if the motorway is only two lanes wide, e.g. if the left lane is closed. When changing lanes indicate your intentions and use your mirrors and a shoulder check to cover off your blind spots before you make your manoeuvre. You can overtake other traffic on either side when travelling in a one-way street, as long as there are lanes and it's safe. Make full use of your mirrors and ensure that it's clear all around before you attempt to overtake. Look for signs and road markings and use the most suitable lane for your destination. You might see contraflow bus and cycle lanes on a one-way street. In a contraflow lane the traffic permitted to use it travels in the opposite direction to traffic in the other lanes on the road. When driving down a narrow street look out for children running out from between cars, cars opening their doors, cars pulling out, and be careful of your wing mirrors hitting other vehicles. If there are passing bays on your left then you will need to use them if you meet another vehicle and there's not enough room for both of you to pass. If you meet an obstruction on your side of the road, give way to it until it can get out of your way; or if it's a stationary obstruction give way to oncoming traffic until you can drive around it. Cycle lanes are marked by a solid white line. You must not drive or park in them at any time. The cycle lanes are there for a reason. Keep them free and allow cyclists to use them. It is illegal to drive or park in a cycle lane, marked by a solid white line, during its hours of operation. Parking in a cycle lane will obstruct cyclists and they may move into the path of traffic on the main carriageway as they ride around the obstruction. This could be hazardous for both the cyclist and other road users. When approaching a right-hand bend you should keep well to the left. Doing this will give you an earlier view around the bend and enable you to see any hazards sooner. It also reduces the risk of collision with an oncoming vehicle that may have drifted over the centre line while taking the bend. When driving a long vehicle around corners it's sometimes necessary to adopt a different road position and straddle lanes to avoid mounting the kerb or colliding with street furniture such as lamp posts, traffic signs, etc. Other road users may not understand what you intend to do next. Be on your guard for other road users by using your mirrors to check all around your vehicle. Other traffic might try to move up alongside in the gap you've left to make your turn. Good planning and anticipation will allow you to signal your intentions to other road users and take up your position in good time. The turning circle is the amount of space needed for the vehicle to turn. You'll need to consider this as you approach junctions and road layouts, especially if you have large overhangs (these are common on some buses and also vehicles like car transporters. If you're driving a new or temporary vehicle, familiarise yourself with its characteristics before you drive on public roads. High-sided empty vehicles, and high-sided vehicles with top-heavy loads will be the most unstable in strong crosswinds and could blow over. Double-deck buses are at risk as well as lorries, cars towing high-sided trailers and caravans, scooter riders, cyclists and motorcyclists. Take care in exposed places, especially if you are emerging from a structure that is sheltering you from the wind. Take into account whether the road will be exposed and if there will be bridges, motorway flyovers or viaducts to cross. Be sensible and avoid these areas if possible in high winds. Scooter riders, motorcyclists and cyclists can be blown off-course easily and into the path of your vehicle, so take care overtaking, giving them plenty of room. If your route takes in any locations that are frequently subjected to high winds, such as, high-level bridges, high-level roads, exposed viaducts or exposed stretches of motorway, listen to the weather forecasts, which will inform you of any need to replan your route. You might find buffer lanes in some areas. Heavy and/or tall vehicles might be diverted if winds become too strong. If you're driving an empty curtain-sided vehicle, you can help to lower the resistance to side winds if you tie back the curtains. The air will be able to flow across the flat bed of the vehicle and lessen any loss of control, particularly when crossing exposed viaducts or bridges. Here's how a truck gets blown over in the wind. Tailgating is where you drive too close to the vehicle in front for you to be able to stop if the vehicle in front stops. Tailgating increases your chance of having a nose-to-tail accident because it means that you can’t see what’s happening ahead. Tailgating prevents overtaking drivers from moving back into your lane, and can prevent the driver you are following from knowing that you are there if the driver can’t see you in the mirrors. Read more about tailgating here. Long vehicles should be aware of grounding on humpback bridges, level crossings, traffic calming humps and sharp crests in the road. Signs are sometimes shown where this is a risk. A vehicle travelling downhill will need more braking effort, will take longer to stop, and will pick up speed more quickly. Whenever you brake, the moving energy of your vehicle is converted into heat. Continuous use of the brakes, particularly from high speed or on long steep descents, can cause the shoes and drums to overheat. This will make them less effective and in some cases they may not work at all.